A key component of workplace ethics and behavior is integrity, being honest and doing the right things at all times. When it comes to ethics in the field of finance, ethical behavior is so important because finance involves the management of other people’s capital. Ethics in finance is one of the main things which everyone has to follow from the small, medium, and big level company because almost all the country depend upon the financial background of the country because without financial component, no business can run for a long time. The assumption of modern financial-economic theory runs counter to the ideas of honesty, devotion, dependability and loyalty. Ethics in finance may vary from different industries to different but everyone is liable to do their work at utmost good faith. People who are involved in finance activity have to serve both their company and their customers at utmost good faith. Profit, but not at any cost: – A modern capitalist economy has its very foundation the principle of profit. Without profit, the economy doesn’t grow. Thus, financial service professionals are obliged to pursue a profit as the result of their activities. However, a modern economy only works if that profit is earned within a framework of rules and regulations that apply and are adhered by everyone. Profit should be earned by following the rules and regulations, not by conducting any wrong practice. The client’s interest first: – Financial services is a wide sector and the ‘client’ may take many shapes and forms. Client can be any investor or the government. Whoever the client might be, an ethical approach to financial services will always put the client’s interest first. Financial services should see their own income as reward for improving the financial health of their client’s .There is nothing wrong with a fund or its manager making money, bit their profit should not come at the expense of their clients. A commitment to excellence: – An ethical approach to financial services would see professionals and the organisations that they represent constantly striving to do the best job they possibly can do under the circumstances. This means avoiding a mentality of doing enough, and stopping there. Commitment to both excellent results and technical accuracy in each step of the processes leading to that result which is required. Ethics prioritized over client instruction: – unethical behaviour in Financial Services can also be provoked by clients themselves. Whether it be through strong encouragement to help them minimize tax within the grey areas of international tax law, or any other activity that could be interpreted as giving them an unfair advantage, it is far from uncommon for financial services professionals to be put under pressure by their clients to conduct activities they may not consider ethical. Financial Services run ethically will prioritize ethical conduct even when by doing so they may decline to undertake activities expressly requested by the client, even at the risk of losing that client’s business. Legal is not always ethical: – There may be many instances where a particular course of action may be considered unethical despite not directly contravening the laws and the regulations. Ethical financial services means choosing not to act in a certain way, or perform certain activities, despite the fact that doing so may not technically mean breaking any laws. Choosing not to exploit technicalities that may mean an activity is legal because it is considered unethical is the mark of a truly ethical approach. Accuracy: – A company’s financial manager ensures that all financial publications accurately and fairly reflect the financial condition of the company. Accounting errors and financial fraud. Such as what was seen in the cases of Enron and WorldCom, damage the interests of shareholders, employees and affect confidence in the financial system. Some Organizations makes ethics guidelines specifically for financial managers. Transparency: – Financial documents reflect a company’s performance relative to its peers, the internal strengths and weakness. Regulatory agencies require publicity traded companies to submit periodic financial statements and make full disclosures of material information. Transparency means explaining financial information clearly, especially for those who aren’t familiar with the company’s operations. Financial managers should not hide, obscure or otherwise render relevant financial information impossible for ordinary shareholders to understand. Timeless: – Timely financial information is just as important as accurate and transparent information. Management, investors and other stakeholders require timely information to make the right decisions. Many cases exist of a publicly trade company’s stock reacting sharply and negatively to negative earnings surprises or unpleasant product-related news. For example, a company should promptly disclose manufacturing problems that could temporarily affect sales. Similarly, the company should not hold back news of a major contract loss in the hope that it can replace the lost revenue with new contracts. Integrity: – Financial managers should strive for unimpeachable integrity. Customers, shareholders and employees should be able to trust a financial manager’s word. Managers should not allow prejudice, bias and conflicts of interest to influence their actions. Managers should disclose real or apparent conflicts of interest. Earnings management is a tool for satisfying self-interest of the managers. But, it can be used for the welfare of the stake holders, if it is ethically used. So, to get the optimum benefit, accounting standards should be ensured. Finally, the consciousness and the morality of the stake holders can turn this malpractice into a good one if the motivations behind the earnings management are free from evil intentions. What is the main reason for Considering ethics in finance?? Your hard work says it all. good written article with good examples… use of pictures is attractive…. hope you will write more better blogs in future. All the best !! Can you give some examples of violation of ethics in the companies ? Exceptionally well. Quite informative and can easily rely on the information served by you. Thank you so much for sharing this! Well knitted blog, but can you state any example where legal isn’t ethical? Exploiting workers is common way that businesses choose to increase their profits. These practices are not ethical. These include paying them low wages or outsourcing their manufacturing activities overseas. They know that some foreign countries have little or no laws about minimum wages and forced labor. Others force their workers to work extra hours and fire those who raise complaints. What is the major reason for considering ethics in financie sector? Finance is all about quantitative aspects. Financial department of every organisation has the responsibility to ascertain true position of profit and loses, financial position, fund raising and much more. If there would be any lack of ethics in finance all the above estimations would be wrong and therefore, this will harm the interest of the customers. Honestly, your best yet! I’ll say, the way it’s written is commendable. The examples made me understand everything much better! Yes I totally agree with your views. Ethics is mandatory to be followed in each and every field.heights . What was the major reason that ethics should be implemented in the field of finance ? Ethics being qualitative and finance being quantitative , what is the relation between these two things which are different in nature ? Following ethics is important in every field whether it is finance , hr , marketing or in day to day life also. The major reason for implementing ethics in finance was that finance is a core part of a organisation which handles all the quantitative aspects of that. If there would be no ethics or unethical practices followed , it will coat a lot to the customers, and the organisation also as it is all related to money. Being unethical in case of money would be the greatest loss as the financial position of the organisation would not be identified properly , morover, there would be wrong estimation of profit and loses and true actions would not be taken in tge organisation due to all the wrong estimations. Can you state a case of a company which was accused for following unethical practices in finance ? Yes, there is big case we are hearing now a days in news i.e about ICICI bank ‘Chanda Kochhar’s case. Which has be in alligations of nepotism and curroption in loans granted by the private sector lender to the videocon group. What is objective of ethics in the field of finance ? And why that objective is specified by you for that particular field ? 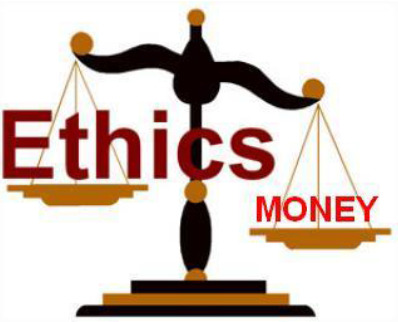 The main of objective of ethics in finance is the relaibility of the financial statements of an organisation…. because at the end business is all dependent on its financial position in order to raise fund, in order for production, and also to have a goodwill in the market.